For many people who’ve lost one or multiple teeth, dental implants are a great alternative to dentures because they feel natural and don’t decay. 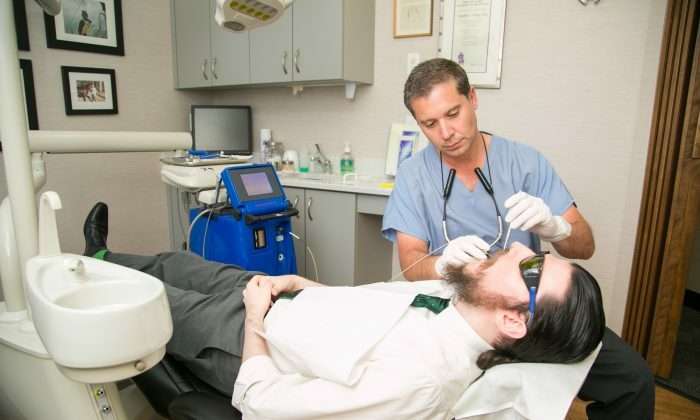 But having implants does not give you a free pass to forget about cleaning and regular preventive maintenance, said Dr. John Lanzetta, a periodontist at Madison Avenue Periodontics who specializes in dental laser surgery. According to Dr. Lanzetta, some people with dental implants mistakenly think that since the implants are disease resistant, they don’t have to brush and floss as diligently. Nothing could be further from reality. If you don’t have good dental care habits, you could end up with a type of infection that’s unique to implants: peri-implantitis. Peri-implantitis, similar to gum disease (periodontitis), is caused by types of bacteria that colonize the surface of the implant. “They’re a slightly different species of organism, but they have the same end result,” said Dr. Matthew Neary, who also specializes in dental laser surgery. These bacteria destroy bone and gum tissue surrounding the implant, and can cause the bone to pull away from the implant. This slowly exposes the screw and can cause the implant to fail, Dr. Neary said. Once they become exposed, the threads of the implant screw are harder to clean than a natural tooth. “Bacteria love crevices,” he said. According to published studies that Dr. Neary has reviewed, smokers are the most susceptible to failing implants, even if they brush regularly. But smokers aren’t the only ones at risk. Failure of an implant means it gets loose and must be removed. Diabetics, substance abusers, and those with osteoporosis should brush regularly and get professional cleanings every three to four months, said Dr. Chris Chondrogiannis, another member of the team of periodontists at Madison Avenue Periodontics. “Failure of an implant means it gets loose and must be removed,” Dr. Chondrogiannis said. But not every infected implant has to eventually fail. When an implant becomes infected, a laser decontamination procedure can help clear it. The team at Madison Avenue Periodontics treats infected implants with a procedure termed LAPIP (laser assisted peri-implantitis procedure). Click here to stop infection around your dental implants. LAPIP treatments utilize the PerioLase MVP-7 to selectively kill disease-causing bacteria, as well as remove infected gum tissue while leaving healthy tissue intact. In addition, a thermal blood clot generated by the laser has the ability to stimulate bone repair by harnessing the body’s own bone and soft tissue regeneration factors. There are no incisions, no sutures, no graft materials or external growth factors used, and little to no postoperative discomfort. For about 40 years, the gold standard for bone regeneration has been conventional surgery using bone grafts, growth factors, and other biological materials. The risks include swelling, bleeding, and considerable post-op pain. This laser has a wavelength that is particularly effective at treating gum disease. It was originally FDA-approved for soft tissue repair, but in March this year, the FDA also approved PerioLase for its ability to help bones regenerate. The FDA is very strict about what true regeneration is, according to Dr. Chondrogiannis. To meet FDA’s standards, the laser must be able to regenerate bone so that it attaches to the implant. With laser treatments for peri-implantitis, patients spend less time in the dentist’s chair and have a shorter recovery time, fewer follow-up visits, and a lot less discomfort. It seems too good to be true, so people expect LAPIP to be more expensive than conventional surgery. “In fact, it’s a lot less expensive because we don’t need to use costly bio-materials,” Dr. Lanzetta said, referring to bone grafts and other growth factors used to regenerate bone. In addition, patients with chronic diseases don’t have to stop taking their medications. For example, heart patients who take blood thinners like Coumadin, Plavix, and Xarelto might have to stop taking the medication while undergoing conventional surgery, to reduce the risk of increased bleeding. Or they might not be candidates for surgery in the first place. The LAPIP procedure allows patients to continue taking their medications because the laser creates stable blood clots, Dr. Chondrogiannis said. The best defense against infection is to practice excellent oral hygiene and get regular checkups. It’s especially important to contact a periodontist if your gums bleed during brushing.